Innovation is intertwined in Cincinnati’s DNA, and the city showed off its best and brightest July 21 at the second annual NewCo Cincinnati organized by Cintrifuse. NewCo is an “inside-out” conference, pushing attendees out into the offices, performance venues and factories of host companies. There’s no sitting quietly in a giant windowless ballroom while men in suits talk at the crowd from a stage. More than 900 tickets were sold for last week’s event, a significant increase in paid attendance, and 96 percent of ticket buyers actually built a schedule and attended sessions, a high percentage compared to other national and international NewCo festivals. John Battelle and Brian Monahan started NewCo in San Francisco in 2012, and this year will see NewCo festivals in cities like Istanbul, London, New York and Shanghai in addition to Cincinnati. A low admission fee ($20) and a flexible schedule allowing participants to attend between one and six sessions were designed to encourage participation at NewCo Cincinnati. Cintrifuse made this year’s scheduling more accessible based on feedback from 2015 participants and hosts. In addition to geographic tags, organizers created themed tracks and coded sessions by the type of presentation, such as panel discussion, speaker or subject matter expert. NewCo kicked off with a VIP reception at The Transept July 20, including a keynote talk by Cincinnati Reds COO Phil Castellini. The Reds represent Cincinnati’s tradition of innovation as the first all-professional baseball team and hosts of Major League Baseball’s first night game. Castellini talked about how the Reds consider Greater American Ball Park to be a “newco” as they strive to make it a place for innovative and engaging visitor experiences. NewCo Cincinnati played out the next day across 95 host companies in the urban core and suburbs. No two sessions were the same, and attending every session was impossible. The AGAR team invited NewCo into its vibrant Walnut Street offices, where geometric murals covered the walls. Using examples of their work, team members talked about the broader idea of content and growing culture, soliciting audience feedback and sharing their vision of the future city. A few blocks away at the Taft Theatre, Cincinnati Pops conductor John Morris Russell showed NewCo attendees how to conduct, then let them try directing actual Pops musicians. Participants discovered having a sense of humor is a prerequisite for professional musicians as they performed as conducted, with less than melodic results. FC Cincinnati shared inaugural season highlights in Frost Brown Todd’s 33rd floor conference room. The spectacular view of Over-the-Rhine and the hillsides didn’t distract from President Jeff Berding’s presentation about the club’s successful season so far, including setting the season home attendance record for its league with five home games remaining on the schedule. Source Cincinnati — the regional public relations partnership between REDI, Cincinnati USA Regional Chamber, the Convention and Visitors Bureau and others — presented at the Chamber’s Fourth Street offices. After polling national audiences, they found there’s a significant opportunity to tell Cincinnati’s story to a wider market unfamiliar with the city and region. Out in Blue Ash, Axiom Product Development welcomed participants with popsicles on a hot afternoon. NewCo attendees were also able to try out virtual reality devices during an immersive session. E.W. Scripps showed off views from its 28th floor while exploring American consumption of digital video and audio. With over half of American adults now watching digital streaming video, Scripps is working to expand the reach of its channels and original content on that platform. At one of the last sessions of the day, 3CDC recapped its history and accomplishments to date, including $926 million invested in Cincinnati’s urban core. Moving forward, the development team is focusing on construction at Ziegler Park, building sustainable retail and increasing downtown investment between Seventh Street and Central Parkway. NewCo participants explored subterranean lagering cellars with the Brewery District Community Urban Redevelopment Corporation and We Have Become Vikings and visited other impressive work spaces with hosts ChoreMonster, Hotel Covington and Urban Artifact. Both Xavier University and the University of Cincinnati hosted sessions this year, and a special student registration was offered to encourage participation. Outside of the urban core, NewCo host companies offered sessions in Mason, Blue Ash, Oakley, Northside and the East End. “This year we added more time between sessions, both as time to travel but also for participants to recap, connect and process their experience,” Misali says. 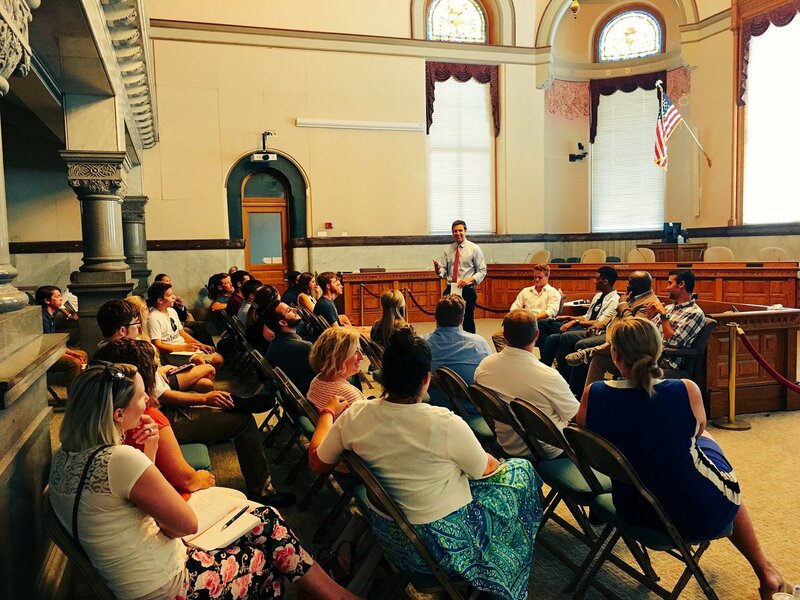 NewCo participants were engaged in their sessions but also sharing quotes, videos, photos and feedback on social media using the #NewCoCincy hashtag on Twitter, Facebook and Instagram. The large social media presence helps set the stage for a 2017 NewCo Cincinnati. Although Cintrifuse is still collecting feedback from attendees, over 35 percent of respondents to date heard about the event via word of mouth. 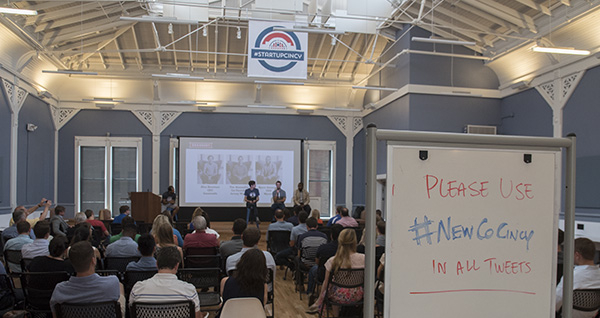 NewCo Cincinnati attracted people new to the city and new to the startup community, but it also attracted new business. As a festival with national and international host cities, NewCo helps establish Cincinnati as an important player in the new economy and the startup world. The festival model encourages businesses to be open and engaging with each other and the general public. NewCo Cincinnati wrapped up with a happy hour party at Anderson Pavilion under the carousel in Smale Park, ending a packed day with another great view of the river and some of the literal bridges that connect our region.